Here's a thought: Who could we cast Liv Tyler or Neve Campbell as? Tyler's big enough to pull off Thella, perhaps. Campbell can be pretty ascerbic, so maybe Mirrim around the time of SoP. the Gaurdian[/I]? He's got the altruistic, selfless concern down, seems like a nice guy, and is also a looker! Now, this idea would be funny. Cast Kutcher as F'lessan in a SoP movie, but cast Demi Moore as Lessa. 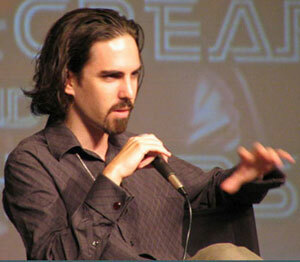 Failing that, how about Bear McCreary, the composer who scores Battlestar Galactica? Dunno if he can act, but he sure as hell can compose! Tahmoh Penikett would make a good dragonrider of some type. I don't have anyone particular in mind. Or perhaps Sebell. He certainly has the height! A little "pretty" for Sebell, though. But he does a good "hanging out in the background, until he's called upon" in BSG. Or, you know, he might make a good Alemi, Menolly's brother. As an off-the-wall suggestion...how about Alan Rickman for Petiron? If we ever had a scene with strife between Robinton and Petiron, Alan Rickman would make that scene rule. Failing that, Alan Rickman might make a good Lord. or Oldtimer. Had a better thought for Campbell: Desdra. Callis is, regrettably, much too short for Robinton, although in theory that's no barrier to a good performance. Look at Jackman as Wolverine...a foot too tall for the character, but a good performance. But given the sheer venality Callis has brought to Gaius Baltar, how about casting him as Meron? I know nothing of McCreary to comment, although I love the drumming in BSG's opening credits. Tahmoh Penikett is such a huge guy (and a good actor), I'm be tempted to dye his hair and cast him as Toric. Alan Rickman certainly has the chops to play Robinton, but it might be a real shock to the system to see him play a flat-out nice guy. Of course, his darker side could bring some zing to scenes with Pinch. I think Alan Tudyk would make a great dragonrider and I was sad to see Wash get fragged in Serenity. I'd say to definitely cast him as one of the happier and more cheery dragonriders, probably a green or blue rider of some significance. Or possibly one of Moreta's bronze admirers...or T'gellan, which would give him the opportunity to play more serious later when Weyrleader of Eastern. As for recycling BSG players, Hogan (Tigh) would make a good Fax or T'ron or T'kul. He can chew the carpet with the best of them. Of course, the guy who plays Tyrol could also pull off those roles. I've always been a great fan of Olmos, and think he might make a good Petiron. Bamber and Sackhoff don't impress me much, although the gal who plays Dualla might be useful. The guy who plays Anders could be recycled in any number of dragonrider roles. Park could make a good Brekke. I liked the gal who played "Kat," but can't think what role to use her in at the moment. I also like the gal who plays "Racetrack," but again can't think of a role at the moment for her. Olmos' son ("Hotdog") would certainly be an easy casting for any number of young dragonriders. Oooh, I like that guy for a younger Robinton! I'm not too fond of Rickman for Petiron though... he could pull it off, but I've always seen Ian McKellan as Petiron. He can definitely do the rough and grumpy, but also a tender side. As Merelan really did love Petiron and Masterharper shows that he did have tenderness for his wife in him, I think McKellan would be ideal. Reading the scenes with Petiron, I can't see anyone but him. Rickman could absolutely perform Petiron's meaner, more gruff side toward Robinton, but I can't imagine him pulling off the kinder side well. Anyone heard any knews on where Copperheart is in development? I think someone had a rumor that they may have been working on the script when the WGA strike hit. I always thought of Lessa as looking like the dark one in the old Charlie's Angels. I think her name is Jaqueline Smith. Revisiting BSG recycling, the gal who plays Racetrack is Leah Cairns. She's small (for an actress) at 5 foot 6 inches and surrounded by tall actors might actually make a decent Lessa. She's currently in her mid-30s, but can successfully play younger for the time being. Tudyk would be great as a dragonrider/Elgion. ED, I was really upset at that point in Serenity too. He was my favourite! I pretty much liked the entire ensemble. If I had to name favorites: Kaylee and Jayne. She's so monstrously out-of-place in that crew that it just works, and Jayne is just every impatient, anti-social thought you've ever had personified. I recently stumbled across a picture of Jason Behr, and I realised in a few shots he seemed to have slightly amber coloured eyes, he also has dark hair and shots from his movie "SkinWalkers" shows he has that rugged look that I envisioned F'lar having. I liked the cast of Firefly too =) They all fit so well together! Long, dark hair, small and quite slim with beautiful eyes. SHame she's a singer. You don't have permission to access /img/clip_immortal/my_immortal042.jpg on this server. I haven't seen the video, but I've heard her voice. Maybe she could play Menolly. Or, if they do flashbacks, she could play Robinton's mother. OT: I'd love to hear a duet between Pat Benatar and Amy Lee. They both have wonderful voices and a great range. And Pat Benatar would be old enough to play Robinton's mother in any flashbacks. While she is not NEARLY thin enough for Lessa, she has the PERFECT eyes and attitude. She doesn't have that "actress" look, which I like. I don't know if she can act well, but I would be willing to sacrifice the description of her being so thin when she is the only woman I've ever seen who could capture the essence of Lessa. However, she's not exactly short. She's not TALL at 5'4, but not really diminutive. Last edited by Spaceman Spiff; May 20 2008 at 12:12 PM. While I'm a fan of Amy (Lee) Hartzler, I can't see her as Lessa. Too big; too solid. Lessa is a wisp of a thing. I've pretty much settled on Leah Cairns for Lessa. She's more delicate, but has the dark hair and eyes. That would be an interesting duet, but the pairing I'd love to hear is Enya and Simone Simons (Epica) if I'm going to combine two female voices--both mezzos with a touch of the upper contralto! Pat Benatar and Cristina Scabbia (Lacuna Coil) would be an interesting match up as well. Of course, I'd much prefer to pair up some high-powered male and female talent. I'd love to hear Simons team up with Marco Hietala (Nightwish). She was simply incredible paired with Ralf Scheepers on Primal Fear's "Every Time It Rains." I still have to YouTube her performances with Roy Khan of Kamelot, but they should be similarly impressive. Hietala teamed up with Liv Kristine (Leaves' Eyes; ex-Theatre of Tragedy) for Delain's debut album, and he formerly paired with Tarja Turunen in Nightwish before she was fired ("I Wish I Had An Angel" is a perfect blend of their voices). Much as I like Hietala, he's not a singer in the class of Geoff Tate, of Queensryche, and I'd love to hear Tate paired with Simons, or with Liv Kristine. Or frankly, pair Tate with Benatar--nothing like a pair of four-octave voices working together. What about Leonardo DiCaprio and Matt Damon...They have grown up quite a bit...they could play brothers or dragonriders I am sure...I got them mixed up several times watching "The Departed"
There are good actresses who could adequately answer Lessa's description. Keira Knightley has been bandied about, is certainly wispy, and her acting credits are good. I've proposed Leah Cairns, who is also a good actress, fairly delicate and somewhat shorter than Knightley. Amy (Lee) Hartzler is not an actress, and it would be a shame to waste her on a non-singing role anyhow, as Lessa is not known for her gilded throat, but for her razor-edged tongue. Theatre of Tragedy, hailing from Norway, concurrently fronted by Nell Sigland of The Crest and formerly by Liv Kristine of Leaves' Eyes. Re: amber eyes; they're probably just an extreme variation of "hazel" that is distinctly more yellowish. E-dragon, you and your intelligence blow me away. And that's a good thing. And that is ALL I have to say about that! Personally, I think that Keira Knightly, pretty as she is, would make a good Lessa. [I] don't know anything about Leah Cairns, other than looking at the photos that y'all posted, so I can't really comment on her! I am sure that she is a good actress, though. I really don't understand why so many people dismiss Amy Lee just because Lessa wouldn't be a singing role. Yes, Amy Lee is a mind-blowing singer, but that doesn't mean it's the ONLY thing she can do. Amy Lee definitely has those powerful eyes, and the ability to pull off her temper and personality. Knightly is diminutive, but not powerful, and power is the quality I prioritize over Lessa's exact physical appearance. And I just can't resist... you say that Amy Lee isn't an actress, but Keira Knightly CAN act? Between Amy Lee and Keira Knightley for Lessa, I'm honestly not quite sure. I wouldn't object to Keira Knightley. She'd definitely do for a DF Lessa, I think, where she's very sure of herself but doesn't think anyone else is. I think, if given the role, she could expand to fit the power behind it. Keep in mind the roles we've seen her in. I have absolutely no more input right now, ha ha ha. Sad. I think I said earlier that I'm an Amy Hartzler fan, so I'm not exactly dismissive of her. She's a great singer, but that's what she is: a singer. She has no acting credentials unless you count a couple of music videos and frankly, I don't. It seems these days that every actor thinks they can sing and every singer thinks they can act and generally they're both quite wrong. Refreshingly, Hartzler doesn't appear to be under the illusion that she's an actress, which is just as well. Now, it is entirely possible that she might make a good actress, just as a motorcycle mechanic might make a good avionics technician, but it's a crap-shoot and one that generally craps out. Knightley is a decent actress and has shown her skill in a variety of roles, and has a successful franchise under her belt. Whether she is a great actress is another question, but she's certainly not bad. Thank you. Nice to know the gray hairs were earned to good purpose. I think Knightley's fine and I was willing to see her in the role until I spotted Cairns. I think Cairns is a better fit who would be more suitable for covering a broader age-band of the character. She also looks good in flight gear, which I consider important for someone playing a dragon-rider, although I reject the notion of "bomber jackets" in favor of more simply made garments similar to short- to mid- length riding coats. Lessa is described as diminutive, but unfortunately Knightley is so bony that even with the camera adding weight, she comes off as a bit of a stick-figure and would probably end up almost comical. Cairns is also dancer-thin (graphically demonstrated in picture five of her 88 Minutes gallery on her website), but has carried off bulky, complicated flight gear in BSG fairly well, and would be just about right for simplified Pernese flight gear. Her face is more mature, which would be appropriate given Lessa's hard early life, but sufficiently angular to get the "elfin" effect sometimes attributed to Lessa's appearance. Knightley's face is more rectangular and a bit too young. Cairns'd also be more visually appealing opposite Clive Owen than Knightley was and provide a more appropriate height differential. And she'd be much easier on the production budget to obtain. I have actually seen one or two people with "amber" eyes in my time and did not find the look particularly appealing. I believe one person's eyes were a heavily yellowed hazel that may have been an extremely faint variety of green (their claimed eye color) and rather sickly looking. The other was probably an extremely pale brown, which was better, but largely due to the person's other natural colorations including blondish-brown hair (probably dyed), and probably mixed racial ancestry (giving the effect of a medium tan). I think amber eyes with black hair as F'lar is described, would be perceived by most as unusual and would be noticed, but I think most people would actually find the effect jarring and unappealing, but that's just my opinion. I view F'lar's eye color as a flaw in his appearance that keeps him from being too perfect as a character, that and his sometimes overly trusting/patient approach to some problems that could benefit from a more active resolution. That matches the second type I saw. That's probably the reason that I've seen Jason Behr's name mentioned as F'lar, as he has the dark hair, and his eyes are probably the closest to amber that I have seen of a dark haired actor in the right age range. Jason Behr's a hottie- OK, OK enough of that. I wonder what he'd look like with shorter hair, though? I'll look him up, no worries, alright? And Leah Cairns. . . well, I'll take your word on that, how's that? Personally I think that Knightly should azt least be offered the role of Lessa, seeing as she is so young, it would be a good challenge for her, even if the sheer power behind it scares her at first. I'm sure that Lessa herself was a little scared right at first (especially regarding F'lar), too, though she hid it extremely well. Imagine being neatly but suddenly thrown into a leadership position in a completely strange place with a guy you may be attracted to for his intelligence, but really hardly know. Wow- that's what any actress who plays Lessa has to live up to, and, whomever it ends up being, it'll have to be a special person. I think the amber eyes/black hair combination is kinda cool, actually, although everyone has every right to their own opinion! I like it for it's difference; it's unique. Does anyone happen to have a copy of People of Pern handy? F'lar's in there, and maybe this is just a compliment to Robin Wood's portraiture, but I find that particular picture almost startling in its intensity. I remember being a little girl Pern fan, and I had developed such a crush on F'lar (like many others, I'm sure! ), and when I got PoP, I turned right away to that page; I had to see. Anyway, even today, when I look at the book, I am a little startled. I'm also a photographer, so maybe I'm just too visually oriented. Is that even possible?
. . . I got one, I got one. . . Adam Beach! I have no idea who he should be, though, Holder, Dragonrider, whomever. He could add that ethnic flair, which I think is very cool. From the pictures of Adam Beach on IMDB, I would peg him as a dragon rider. Maybe a wingleader, or one of the relatively young Weyrleaders in the stories. Almost definitely riding a brown or a bronze. Thanks for the photos, GH! You think he could do K'van? That's a different book though. . . Maybe G'dened? What was the name of the main bronze rider that when south with Kylara? Or the one that eventually bonded with Mirrim? That's T'gellan. He and Monarth always seemed like such cool guys to me.